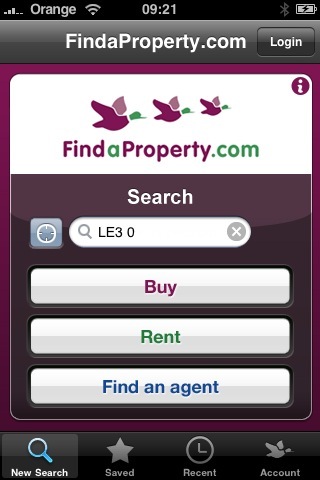 It may have hit your radar this morning that yet another iPhone property app has been released, this time by the property portal findaproperty.com (Part of TDPG) enabling buyers to browse their listing catalogue. Find an agent feature – At last an ap that helps people find an estate agent, and using the GPS function it tells you the agents lited in order of who is geographically closest to you. Don’t sit by the phone waiting for it to ring yet, but a nice feature. Map searching – you can begin your search on the map rather than just locate each individual property on the ma. It can also give you directions to the property using Google maps. Screen swipe through the properties – This is a nice feature that means that you don’t have to return to your original list to view the next property but rather you simply swipe to the right to see the next one on your search list. Refine search – Sliders are used to define clearer search criteria similar to those on the Globrix web site. My only slight negative is that there are no outgoing links to agents’ web sites (just ability to call or email) but having said that, most agent’s web sites aren’t optimised for mobile browsing so it’s probably best left like this. Also, directing clients to web sites often means losing any search criteria which is frustrating, so keeping users in the app maintains the experience. All in all it’s a nice app and one I’m sure house hunters will enjoy using. What are your thoughts? Agents – do you promote or talk about these apps to your clients?